Assistants are summonable NPCs that will follow the player. Similar to pets, they are account-wide items and don't help in combat. 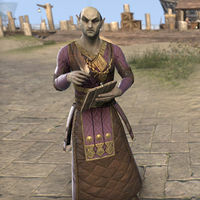 An assistant can be summoned by activating it from the Collections tab, although they cannot be used in Cyrodiil. You can only have one assistant active at a time, and summoning one will dismiss any currently active pet. Unless noted otherwise, all players in a group can also avail of the assistant's services. Assistants can also be placed as Furnishings in Player Houses, and since they are Collectibles, you may place them in multiple houses simulatneously. When placed, all visitors to your house(s) may use their services. 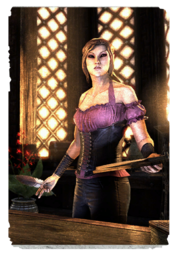 This alert merchant is on hand whenever she's needed, and will buy anything you or your group offer her (though she won't come to Cyrodiil—war is bad for business). You can call her up from the Assistants tab under Collectibles. 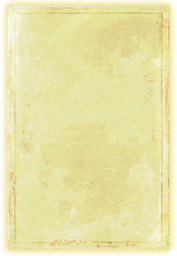 Nuzhimeh is a portable merchant, available for purchase from the Crown Store for 050005,000 . She does not offer repair services like other vendors and has nothing for sale. Nearby players could originally make use of her services, but this was later restricted to group members. 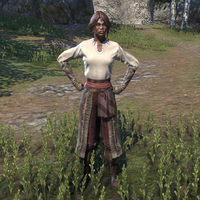 This Baandari Pedlar is on hand whenever she's needed (except in Cyrodiil), and will fence any of your goods for you—but she'll take a cut of the profits. You can call her up from the Assistants tab under Collectibles. 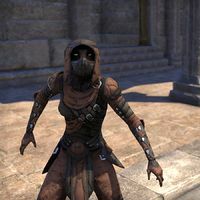 Pirharri the Smuggler is a Khajiit who serves as a portable fence, although making use of her services invokes a 35% fee which regular fences don't have. She also does not offer laundering services. 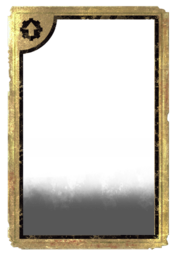 You will receive Pirharri the Smuggler as a reward for completing the Thieves Guild Skill Line and then completing the quest "The One That Got Away". Other group members cannot make use of her services, nor can visitors to your home if she is placed there unless they have also unlocked her. This aristocratic banker is on hand whenever he's needed, available for all banking services for you and your group—except in Cyrodiil, which is far too dangerous for this fellow. You can call him up from the Assistants tab under Collectibles. 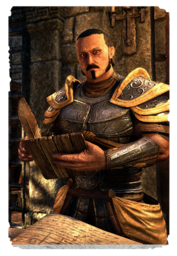 Tythis Andromo is a portable banker, available for purchase from the Crown Store for 050005,000 . He does not provide access to Guild banks or stores. Nearby players could originally make use of his services, but this was later restricted to group members. There are currently three unused inventory icons for assistants. One is Adhazabi Aba-daro (currently seen as a vendor in Cyrodiil). The others are a female "premium vendor" named Allaria Erwen the Exporter, and a male "premium banker" in armor named Cassus Andronicus the Mercenary. This page was last modified on 5 March 2019, at 16:28.